If you choose foods with low energy density — few calories for their bulk — you can eat more volume but consume fewer calories. Feel full on fewer calories? It might sound like another gimmick for weight loss, but it's not. This concept is called energy density, and it's an important weight-loss tool. When you're striving for weight loss, your goal is to eat low-energy-dense foods. This helps you feel fuller on fewer calories. Here's a quick example with raisins and grapes. Raisins have a high energy density — 1 cup of raisins has about 434 calories. Grapes have a low energy density — 1 cup of grapes has about 82 calories. You may feel full after 1 cup of either fruit, but the calorie difference is astounding! Here's a look at energy density by categories in the Mayo Clinic Healthy Weight Pyramid. As you can see, energy density is the underlying principle of the Mayo Clinic Healthy Weight Pyramid. Most vegetables are low in calories but high in volume or weight. Many vegetables contain water, which provides weight without calories. Examples include salad greens, asparagus, green beans, broccoli and zucchini. To add more vegetables to your diet, top your pasta with sautéed vegetables instead of meat or cheese sauce. Decrease the meat portion on your plate and increase the amount of vegetables. Add vegetables to your sandwiches. Snack on raw vegetables. Practically all types of fruit fit into a healthy diet. But some fruits are lower calorie choices than others are. Whole fresh, frozen and canned fruits without syrup are good options. In contrast, fruit juices and dried fruits are concentrated sources of natural sugar and therefore have a high energy density — more calories — and they don't fill you up as much. To fit more fruits into your diet, add blueberries to your cereal in the morning. Try mango or peach slices on whole-wheat toast with a little peanut butter and honey. Or toss some mandarin orange and peach slices into a salad. Many carbohydrates are either grains or made from grains, such as cereal, rice, bread and pasta. Whole grains are the best option because they're higher in fiber and other important nutrients. Emphasize whole grains by simply choosing whole-wheat bread, whole-wheat pasta, oatmeal, brown rice and whole-grain cereal instead of refined grains. Still, because many carbohydrates are higher in energy density, keep an eye on portion sizes. These include food from both plant and animal sources. The healthiest lower energy-dense choices are foods that are high in protein but low in fat, such as legumes (beans, peas and lentils, which are also good sources of fiber), fish, skinless white-meat poultry, fat-free dairy products and egg whites. While fats are high-energy-dense foods, some fats are healthier than others. Include small amounts of healthy monounsaturated and polyunsaturated fats in your diet. Nuts, seeds, and oils, such as olive, flaxseed and safflower oils, contain healthy fats. Like fats, sweets are typically high in energy density. Good options for sweets include those that are low in added fat and contain healthy ingredients, such as fruits, whole grains and low-fat dairy. Examples include fresh fruit topped with low-fat yogurt, a cookie made with whole-wheat flour or a scoop of low-fat ice cream. The keys to sweets are to keep the serving size small and the ingredients healthy. Even a small piece of dark chocolate can fit into a weight-loss plan. When you stick to the concept of energy density, you don't have to feel hungry or deprived. 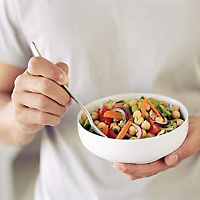 By including plenty of fresh fruits and vegetables and whole grains in your diet, you can feel full on fewer calories. You may even have room in your diet for a tasty sweet on occasion. By eating larger portions of low-energy-dense foods, you squelch those hunger pains, take in fewer calories and feel better about your meal, which contributes to how satisfied you feel overall.